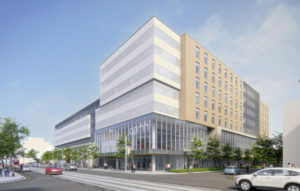 A rendering of the Centre for Addiction and Mental Health’s (CAMH’s) Crisis and Critical Care Building in Toronto. The two new treatment, research, and education facilities are part of a 10-year, three-phase redevelopment plan for the CAMH site. Groundbreaking on these two buildings was in October 2017. When construction is completed, the two hospital buildings will occupy more than 55,742 m2 (600,000 sf) of space. The Ontario government is investing more than $633 million toward the construction of the two new facilities. The Crisis and Critical Care Building will include emergency mental health care, specialized clinics, and 125 inpatient beds. The McCain Complex Care and Recovery Centre will include 110 beds to support patients with more serious mental health challenges, specialized programs and services, and a space for research and education.